Did you know that eating just three bananas a day can reduce your risk of stroke by as much as 21 percent? And that is just one of the countless health benefits bananas provide. The potassium in bananas can also help balance all the fluids in your body, enabling them to keep your brain, heart, muscles and nerves functioning at optimal levels. Apart from the abundance of potassium, every banana also contains 3 grams of fiber, 1 gram of protein, 25 percent of your daily recommended vitamin B6 requirements, 16 percent manganese, 14 percent vitamin C, 12 percent potassium as well as fiber, copper, biotin and magnesium. All of this in one medium-sized banana! The only problem with nature’s wonderful pre-packaged fruit is that it tends to get overripe far too quickly, especially in warmer weather and then you are left with a mushy, brown mess that typically gets tossed. 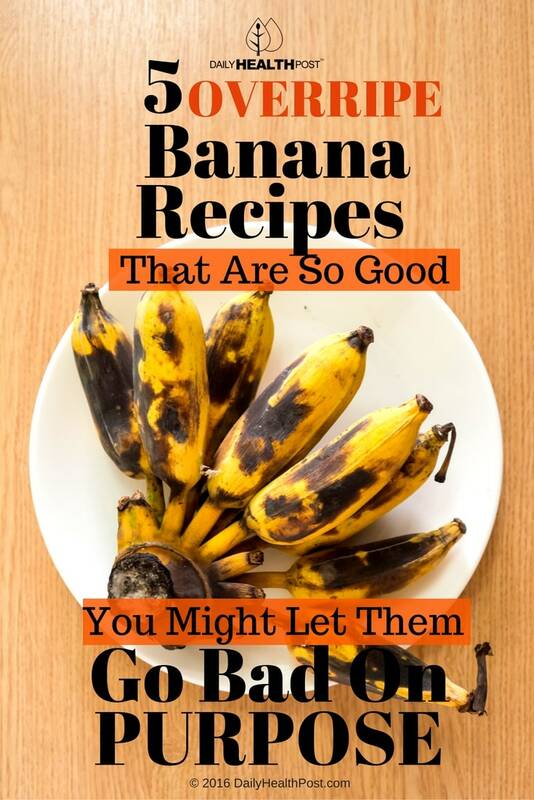 Now, you can use these overripe bananas in some healthy recipes that not only taste great but can still provide you with all the nutritional benefits that bananas can offer. 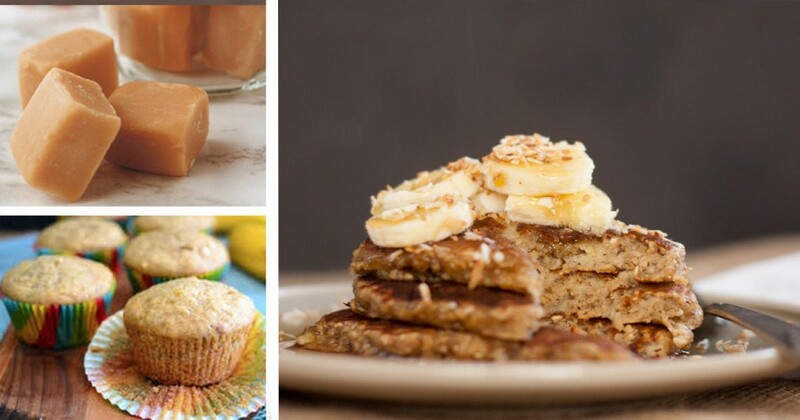 Here are 5 amazing recipes that you can make using overripe bananas. 2 teaspoons chia seeds (soak the chia seeds in 4 teaspoons of water for an hour or make ahead in larger batches using a 2:1 ratio water to chia seeds and store in the refrigerator for up to a week). Combine all of the ingredients in a blender and purée on high until the mixture is smooth—about 1 minute. Serve with a sprinkle of cinnamon and salt to taste and serve immediately. Mash the banana until it has a pudding-like consistency creating 1/3 to 1/2 cup of mashed bananas. Whisk the eggs together until the completely combined and then pour over the banana mixture and stir until everything is completely combined—the batter will look liquidy but don’t worry! Add a little butter or coconut oil in a pan over medium heat and drop about 2 tablespoons of batter onto the hot pan—it should sizzle immediately so if it doesn’t, turn up the heat slightly. Cook for about 1 minute until the bottom is golden brown—the middle will still be loose. At this point you can sprinkle toppings like nuts or chocolate chips over the top while the first side cooks. Flip the pancakes very gently and slowly—some of the loose batter may spill out, just lay the pancake on top of the spill and nudge any excess back under the pancake. Cook the pancake for another minute or until the other side is also golden-brown. Serve warm. Add maple syrup, honey, jam, or any extra toppings you like and enjoy. Heat about 1 teaspoon butter or olive or coconut oil in a 2-quart saucepan over medium heat. Add the oats and fry them for about 3 minutes, or until toasted. Pour in the water and add the salt. Stir. Turn off the heat and cover the pan. Leave it on the stove, and go to bed! In the morning mash the overripe bananas with a fork. Uncover the pan of oats and bring it back up to a simmer. To thin it out or make it creamier, stir in a cup of milk of your choosing before reheating. Add the bananas and mix all the ingredients together. When the oatmeal is warm, serve and enjoy. You can add a dash of cinnamon to tatse if you like. TIP: You can also freeze overripe bananas to use later in baking recipes.